Tom Uglys Bridge crosses the Georges River between the suburbs of Blakehurst and Sylvania. This box girder span opened in 1987 and duplicated a truss span which opened in 1929 and can be seen here. 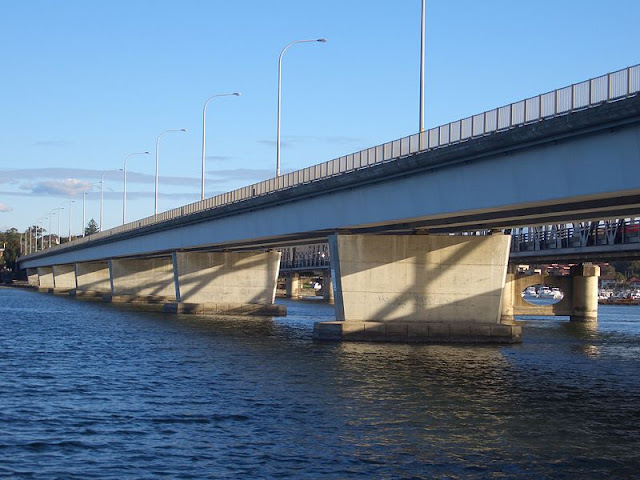 When the original bridge was built, it was known as the Georges River Bridge, but was renamed to distinguish between the various bridges on the river following the opening of the Captain Cook Bridge in 1965 and the Alfords Point Bridge in 1973. Tom Uglys Bridge took its name from the southernmost part of Blakehurst, known as Tom Uglys Point, which is believed to be named after local resident Tom Huxley and transformed by the mispronunciation by local Aborigines. It looks graceful, which you don't expect from the mispronounced name. Nice - functional, and definitely not ugly. Love the name of the bridge, love the shadows! I prefer the old bridge and I think this one wears its name quite well. It's a shame they didn't build a truss bridge for the duplication. I do like the shadow play here.